WebScan PRO is an application that can seriously jeopardize your system’s security. Although you may not be aware that you have installed it on your system, the point is that this adware program does not even need to slither into the target PC surreptitiously. Users install the program themselves when they engage in freeware downloading and installation. Due to potential threats this application may pose, it is important that you remove WebScan PRO from your computer at once. Simply delete the application via Control Panel and then scan your computer with a licensed antispyware tool that can help you locate other potential threats. The reason we suggest that you scan your PC right now is that WebScan PRO usually comes bundled in software packages. This means that it gets installed on your computer along with several other programs. The same distribution tactic has been employed by PursePerks, SecurityPatchUpdater, HealthcareGovTool, and many other adware applications from the same family. They trick users into installing them by diverting their attention into some application that a user supposedly needs. It would be possible to avoid that if users were to check every step on the installation wizard carefully. Unfortunately, we know well enough that users tend to breeze through the installation without ever giving it a second thought. This adware application installs an extension on Chrome, Firefox, and Internet Explorer. Supposedly, this extension should help you scan various websites before you access them, thereby avoiding severe computer security issues. But the problem is that the WebScan PRO extension is an issue itself. As long as you have this add-on on your browser, your online activity will be monitored. Soon enough, WebScan PRO will know all the websites you frequent the most often and all the queries you enter into your search engine. infected with malware. Therefore, there is no reason you should tolerate this application any longer. If you do not do anything about WebScan PRO, eventually, this adware application could be exploited by cyber criminals to display dangerous content. From there, you would be only one click away from an actual malware infection. That is surely something you need to avoid at any cost, so please follow the instructions below to get rid of WebScan PRO once and for all. Manual removal may not be fully effective, so it always a good idea to run a full system scan with the SpyHunter free scanner. This way you will be able to determine whether your computer is absolutely safe, at the same time protecting it from similar threats. Right-click the Windows icon on the left of your taskbar. Open Uninstall a program and remove WebScan PRO. 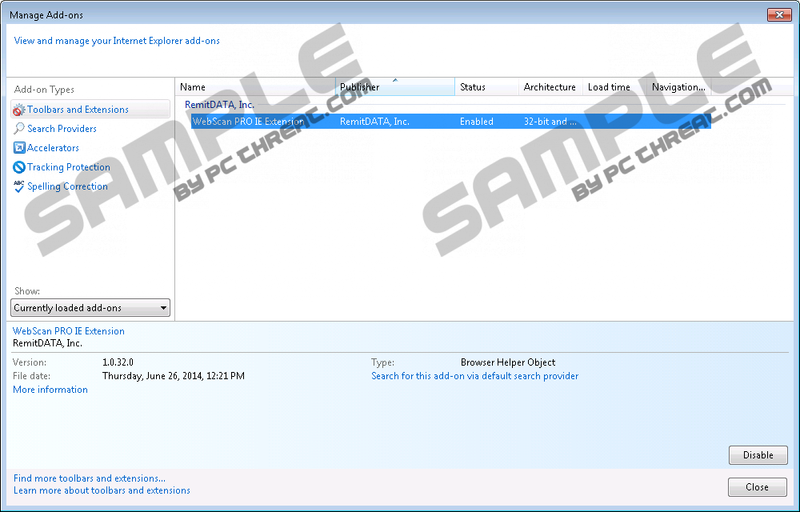 Select Add or remove programs and uninstall WebScan PRO. Disable and remove WebScan PRO from Extensions. Select Extensions and remove WebScan PRO. Quick & tested solution for WebScan PRO removal.